Chaos Computer Club Zürich | Our ultimaker2 now has dual extrusion! Our Ultimaker2 now has dual extrusion! 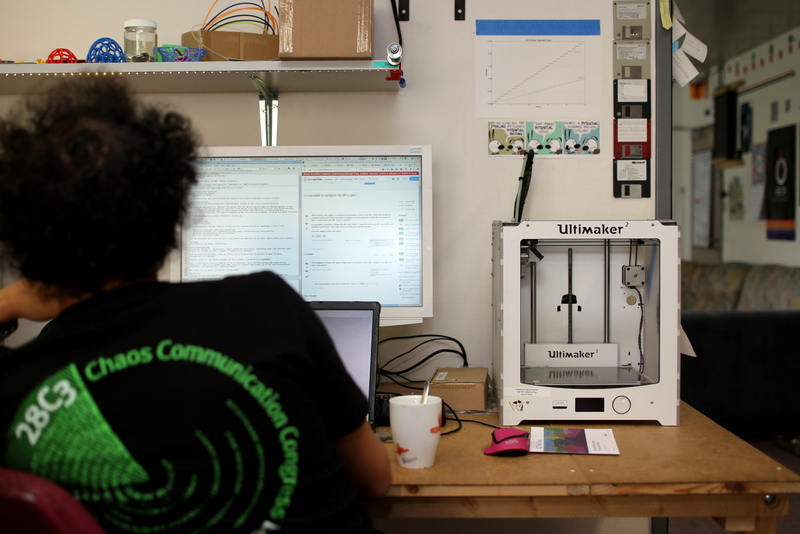 Our space's most reliable 3D printer has for years been an Ultimaker2 (purchased years ago by Feuermurmel). You can even see it on the picture of the lab! It's really the most reliable workhorse that we have around (for instance most of all Fillygons have been printed on it). Some time ago, lsr mused about the fact that the hot-end has space for a second nozzle and some holes in the case for mounting a second extruder; got curious and had a look under the bottom cover - turns out, even the mainboard of the Ultimaker2 has all the connectors for a second: heating element, temperature sensor and extruder. Nice! The next logical step was to purchase some PTFE tubing (inside: 4mm, outside: 6mm), a nozzle, a heating element, a temperature sensor and an extruder from Ali for a Proof of Concept (PoC). We also needed a compatible stepper motor - but as one stepper motor for an axis broke down some time ago and the replacement was accidentially purchased according to the specs of the extruder stepper motor, we just took a (weaker) axis-compatible stepper motor we had lying around, replaced the "too-strong-anyway" axis-stepper and put in the place of the second extruder. So - hardware in place! As in every hackerspace, some time went by before we found time for the software part. The first approach was - after some googling - to find out if there was indeed already some firmware around. Turns out, Ultimaker (still) ships Cura with the firmware for an Ultimaker2 with two hotends. This file can be found (after Cura is installed) in the directory resources/cura/resources/firmware/marlinultimaker2-dual.hex or on GitHub. We installed that on the printer and it worked - kind of. Ari did some tests, and in fact there was filament coming out of the 2nd hotend! To actually make use of the setup, we of course needed a slicer to have the printer model with two extruders. As this is not available out of the box, hellerbarde created a Printer-model (by copying the existing Ultimaker2 model) and modified it a bit. The files for the two extruders are also available. They need to be put in the right directories. 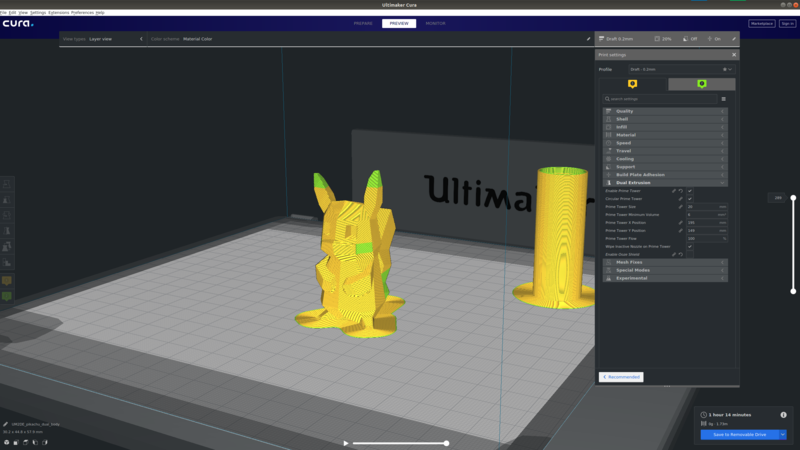 Voila - now it is possible to add a new machine in Cura that is an "Ultimaker 2 with two Hotends". After some tinkering it turned out that the Cura stock firmware was not that good - so hellerbarde built TinkerGnome and flashed that. Nearly there! To actually print a model with two colours, it's necessary to import two .stl files into Cura, then - for each model - click on the extruder on the left and then on the model on the plate. Finally just select both models, right click and chose "Merge Models" from the context menu.